The S&P 500 ($INX) has rebounded 20% so far since its July 2010 low, which comes as bad news to perma-bears like Nouriel Roubini, Gary Shilling, and my personal favorite, PIMCO's Bill Gross, all of whom predicted the opposite. This raises several questions: Do stocks move based on economic forecasts? How much does a pundit's profit motive shape what he or she says? How does the media decide which pundit to give a podium to? The quick answers to those questions: Nobody knows; a lot; and quotability plus advertising revenue. These pessimists argued that a lousy economy was going to get worse, which would be bad for stocks. According to Bloomberg, for example, money manager Shilling predicted the housing market collapse, which gave him enough credibility to be taken seriously by the media when he made his August 2010 claim that the economy "doesn't have much gas anymore" and may enter a second recession. Meanwhile, Roubini, who recommended selling stocks before the S&P 500 fell as much as 57% from its October 2007 record, said in July 2010 that the market would fall further, and argued that the global economy would be weak throughout 2010 due to Americans reducing their personal debt, spending less and saving more. But in a Dec. 3 statement, Roubini claims he does not comment on the direction of markets, only "fundamental direction." Then there's my favorite pundit, Gross, who told me in a Feb. 26, 2009, BloggingStocks interview that stocks were dead. His argument then was that stocks were not worth the risk because the economy was in a period of sustained low growth. Because stocks are only valuable during periods of high growth, he argued, and are at risk of being wiped out in a bankruptcy, investors should avoid them. Since then, the S&P 500 has poked a sharp stick in Gross's gut -- rising 58% from the 775 level it traded at then. For what it's worth, the economy has generally defied double-dip predictions because the layoffs that created high unemployment have also boosted corporate profits. The median of 63 GDP estimates in a Bloomberg survey predicts 2.7% GDP growth in 2010, 2.5% growth in 2011, and 3% growth in 2012. People with jobs are spending more again -- witness the 16% rise in 2010 holiday sales -- and the painful squeeze on the workers who remain is helping companies meet that demand while racking up record profits of $1.66 trillion. Do stocks move based on economic forecasts? Nobody really knows why stocks move up and down except for the people who control the biggest proportion of stock market volume -- and they're not talking. What we do know is that around 70% of all trading is done by high-frequency traders who hold their positions in specific stocks for an average of about 11 seconds. All of this is done by computer programs, and it's unlikely that those trading computers use economic forecasts to determine their buys and sells. And investigations under way suggest that some share of the remaining 30% of trading is done by hedge funds acting on inside information. How much does a pundit's profit motive shape what they say? if you understand how these pundits are compensated, you can be nearly 100% sure that the pundit will "talk his book." For Gross, talking down stocks and talking up bonds is a $1.236 trillion imperative -- that's the value of the bond portfolio he manages. For Roubini, pessimism got him the podium when he was deemed prophetic regarding the financial crisis, and he can't change his tune without risking a loss of media market share. How does the media decide which pundits to give a podium to? I'm not completely sure, but I would guess that most media outlets love a colorful personality who gives good quotes -- and if, like Gross, he also advertises (as PIMCO does on CNBC's The Bond Report), you have the perfect pundit. 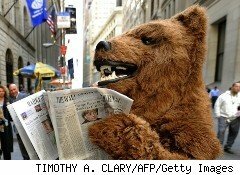 The media has gotten into the habit of delivering reports on daily developments in the global economy, and suggesting that those events somehow cause changes in stock prices, and nobody challenges that flawed logic. That's great news for Wall Street insiders, because this reporting -- and the idea that the news of the day is moving the market -- boosts the odds that the public will buy and sell stocks more frequently, which will increase their stock trading commissions. The final question is whether any of this helps the average investor, to which the answer is a resounding "No!" It's a bit silly for investors to think that these pundits would actually provide any valuable insights to the general public. After all, when was the last time you wrote a check for Roubini's opinions or Gross's punditry? And in their defense, even a broken clock is right twice a day. If there are any valuable investing insights to be had, the people who get them will be the ones who pay through the nose for the information. For the rest of us, as Marie Antoinette said: "Let them eat cake!"